The herbomineral formulations usage have been increased world-wide in health care sector due to their high safety and better therapeutic action. A new proprietary herbomineral formulation was formulated with a mixture of the minerals (zinc, magnesium, and selenium) and the herbal root extract ashwagandha. 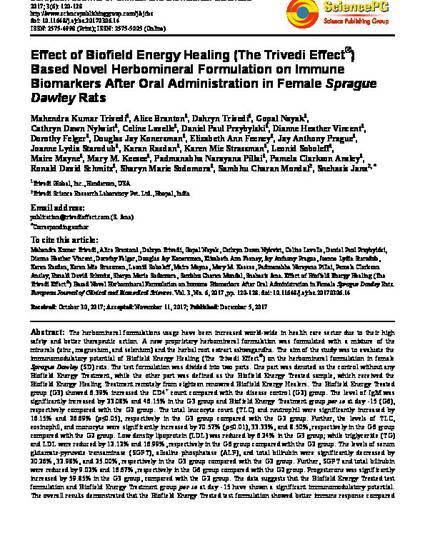 The aim of the study was to evaluate the immunomodulatory potential of Biofield Energy Healing (The Trivedi Effect®) on the herbomineral formulation in female Sprague Dawley (SD) rats. The test formulation was divided into two parts. One part was denoted as the control without any Biofield Energy Treatment, while the other part was defined as the Biofield Energy Treated sample, which received the Biofield Energy Healing Treatment remotely from eighteen renowned Biofield Energy Healers. The Biofield Energy Treated group (G3) showed 6.39% increased the CD4+ count compared with the disease control (G2) group. The level of IgM was significantly increased by 23.08% and 46.15% in the G3 group and Biofield Energy Treatment group per se at day -15 (G6), respectively compared with the G2 group. The total leucocyte count (TLC) and neutrophil were significantly increased by 16.15% and 26.69% (p≤0.05), respectively in the G3 group compared with the G2 group. Further, the levels of TLC, eosinophil, and monocyte were significantly increased by 70.57% (p≤0.01), 33.33%, and 8.50%, respectively in the G6 group compared with the G2 group. Low density lipoprotein (LDL) was reduced by 6.24% in the G3 group; while triglyceride (TG) and LDL were reduced by 12.12% and 16.99%, respectively in the G6 group compared with the G2 group. The levels of serum glutamate-pyruvate transaminase (SGPT), alkaline phosphatase (ALP), and total bilirubin were significantly decreased by 20.26%, 32.98%, and 25.00%, respectively in the G3 group compared with the G2 group. Further, SGPT and total bilirubin were reduced by 9.02% and 16.67%, respectively in the G6 group compared with the G2 group. Progesterone was significantly increased by 59.85% in the G3 group, compared with the G2 group. The data suggests that the Biofield Energy Treated test formulation and Biofield Energy Treatment group per se at day -15 have shown a significant immunomodulatory potential. The overall results demonstrated that the Biofield Energy Treated test formulation showed better immune response compared with the untreated test formulation. These data also suggest that the Biofield Energy Treated test formulation can be used for autoimmune and inflammatory diseases, stress management and anti-aging by improving overall health.